The Louisville Leopards Girls Varsity Basketball Team used a second half surge to defeat the host Marlington Dukes 57-43 Wednesday Night at Marlington High School. With the victory, Louisville improves to 8-10 on the year. Three Lady Leopards reached double figures led by Kayla Gibson who poured in a game-high 15 points. Gibson also grabbed 8 boards and and had 3 steals. Erin Hahn and Sherilynn Mullett each scored 10 points in the second half and also both finished with 14 points for Louisville. Hahn also had 5 boards and led all players in several statical categories with 7 steals, 3 assists, and 2 blocks. Mullett recorded her second double double of the season in pulling down a game leading 11 rebounds. The two teams remained deadlocked at 11-11 when the first quarter ended before the Dukes edged out the Leopards in the second quarter to take a 25-24 halftime lead. Louisville took over the game out of the locker room in doubling up Marlington 14-7 in the third quarter and outscoring them 19-11 in the fourth quarter to ice the game by a double digit margin. The Leopards out-shot the Dukes 40% (22 of 55) to 32% (16 of 49) for the evening. Louisville also held a distinct 35-24 edge in rebounds which included a 13-5 advantage on the offensive glass. Marlington was led by Leah Springer who matched Gibson with a game-high 15 points and matched Hahn with a game leading 3 assists. Allison Lacher and Mary Mason also reached double figures with 10 points each for the Dukes. Lacher led the team in rebounds with 8 while Mary Mason grabbed 6 boards and recorded a pair of blocks. With the win, the Lady Leopards have now won 17 of their last 20 contests against the Lady Dukes. Louisville now leads the all-time series 68-19 which includes a 35-7 mark in games played at Marlington. 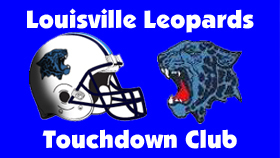 Dating back to 1998, the Leopards have now won 20 of their last 22 road meetings against the Dukes overall. UP NEXT: The Lady Leopards will next hit the road to take on the Youngstown Cardinal Mooney Cardinals on Wednesday, January 30. JV will begin at 6:00 PM and Varsity will follow around 7:30 PM. LEOPARDS: Gibson 5 5-6 15, Hahn 5 3-5 14, Mullett 7 0-2 14, Cole 3 2-2 8, Siegfried 1 0-0 3, Bast 1 0-0 2, Galentine 0 1-1 1. TOTAL 22 11-16 57. DUKES: Springer 6 1-2 15, Lacher 4 2-3 10, Mason 3 2-2 10, Ferrett 1 0-0 3, Lambdin 1 0-0 3, Lepley 1 0-0 2. TOTAL 16 5-7 43. LEOPARDS: Adelman 6 2-4 14, Siegfried 5 0-0 13, Dyer 4 0-0 10, Loy 3 0-0 7, Leghart 2 0-0 4, Joseph 1 0-0 2, Ralston 1 0-0 2. TOTAL 22 2-4 52. DUKES: Thompson 5 0-0 10, Sedei 3 1-2 7, Baum 2 0-0 6, Hall 2 1-2 5, Constantino 2 0-0 4, McElroy 2 0-1 4, Goettel 1 0-0 2. TOTAL 17 2-5 38.